Many of us want to know our purpose. We each have various ways that our purpose will manifest, from grand lives of fame and fortune, like, Oprah, or to seemingly mundane, yet profound journeys. Though our lives may be one of normalcy, and though we may never know fame, we still, each of us, play a key part in the unfolding of all that is. In the end, our purpose, yours and mine, is ultimately the same. It is to share. To illustrate my point, I shall share a story with you. The other day I had a client. The first image I saw when she said her name aloud and I closed my eyes was one of her ice-skating. I shared that. She gasped and interrupted to say, “I love ice skating, I’ve done it my whole life.” To me, this is confirmation from spirit for her, and for me, that I am, indeed, looking at her energy. In short, my answer is God. However, that answer may require some explanation. I believe that we are all energy. As such, there is no real separation. We know this now on a scientific level. Molecularly, we are vibrating atoms, made up mostly of empty space. That table? Not solid. Our bodies? Energy, empty space. If God is an omnipresent, all- encompassing energy, being, or spirit, then we are all part of God. We are one with God, we exist in the mind of God. By closing my eyes and checking in with someone’s energy and “reading” them, I am joining my spirit (which is always joined anyway) with all that is. I can look at your energy and see pictures and know things about you because our separation is an illusion. Distance does not matter. Intention does. Therefore, we all have access to all that is at every moment. Those of us who practice, intend, learn to set space, ask questions and then listen to the answers, develop facility with receiving guidance. 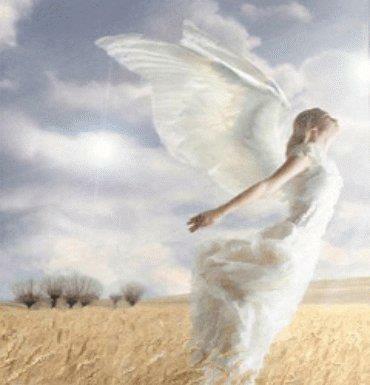 I do believe in Angels, and so I do call upon them to assist me to read and understand the spiritual metaphors I receive. I believe in higher level beings. Again, science has proven that there are multiple dimensions. In my experience, via my readings, dreams, meditations and study, I believe that there are beings that exist on multiple dimensions and can very well be standing at our side. We don’t really die. I know this because I know that energy can’t be created, nor destroyed. I know this because I have just always known. Can I prove it? Not really, not now. Yet, like many psychic abilities, I have always had a kinesthetic feeling, Claircognizance as it is called in the psychic world, that we are spirits first, we have a body. Life transforms, changes, but never expires. I was raised with an open-minded, hippy mother who had been born to two Atheists. She went through a born-again Christian phase and a Buddhist phase, too, along with some other study. She and my father, together, studied eastern philosophies and mysticism in the 1970s as they smoked pot and listened to the Beatles. My maternal grandfather was an Atheist. My maternal grandmother was a born-again Baptist Christian who married a Minister. Together, she and I would wave our hands in the air at church and praise the lord. Her faith left me in awe, knowing not fully what I was doing, but proudly emulating her abiding love of God. Those experiences had me grow up with an open-mind. Above all else, love reigned supreme as far as my beliefs were concerned. More than anything else, I wanted never to offend or separate from another being over a belief, I wanted only to learn, understand, and respect. From the time I was 9 years old, I was writing poetry and short stories and dedicating them to the mystery of life. The subsequent years were spent in a desperate search to understand what God really was. I’ve read the Bible, prayed, talked to Angels, meditated to Buddhist teachings, studied Zen. I even joined a coven of witches once, an ethnography study as part of my Multicultural Anthropology minor course work. In the end, I’d say I’m open-minded, and deeply spiritual. My practice now consists of cultivating my own, personal, intimate relationship with God. It is my sole intention in life to know God for myself. My main spiritual study is with A Course in Miracles. I believe in God. I know I did not create myself. I believe there is a creator, source, Illuminated one, God. Call it him/her whatever you wish, but to talk to spirit, simply call upon spirit. The name is of no importance. The intention, desire, willingness and the pure love in your heart, which ultimately is God, is all you need. Our purpose, all of us, is to find our oneness with Divinity and share our love, our knowing, our truth. To wake up from our dream of duality, believing, falsely, that we are separate from one another and our source, and to awaken to our own Divinity, likeness, oneness with our all loving creator. Sharing your love is the easiest way to be your purpose. If you wish to know the grace of God, or Angels, or the energy of other powerful archetypes, or beings, simply call upon them. Ask them to open your heart, open your mind, remove your blocks to receiving spiritual messages and knowing God for yourself. Then, share. Share your journey, share your love. We are all here to find our way back to source, which consists of realizing the mistake is in the belief that we ever left. We must only awake from the dream, the illusion, and know that we are here, in the heart of God, always. Share your love, your knowings, your imaginings. Sit in a field of grass, warm in the sun and ask to know God. God will answer every time. Don’t believe me though, go find out for yourself.